When people go to see Batman Begins this weekend, there will be rave reviews of how the undead Laurence Olivier knocked it out of the park with his cameo appearance. Mark my words. Quick note: Be sure to place your bids on the auction I’m having for an original piece of artwork over on eBay. There are only 2 days left, so be sure you don’t miss out on the action. I was really pleased with how this piece turned out and hopefully it will make one of you very happy to own it. 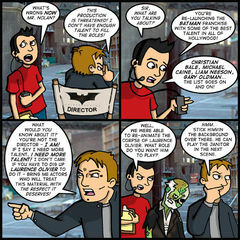 Is it relatively clear that the angry director in today’s strip is Christopher Nolan? I’m always a little paranoid when it comes to my celebrity caricatures. Especially when it comes to celebrities people aren’t very familiar with. EVEN MORE ESPECIALLY when it’s a director with only 3 films under his belt. That’s why I’ve included this handy picture for reference. 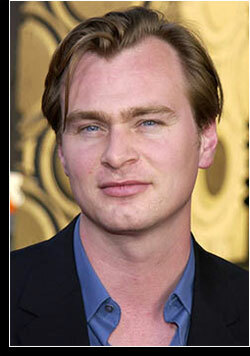 That, kids… is Christopher Nolan, director of Batman Begins. See? We learn something new every day! It’s insane the level of talent Nolan has attracted to his relaunch of the Batman franchise. Who cares if Morgan Freeman admitted to taking the role strictly for the money? This film has Oscar winners and nominees littered all over the place like used bubble gum. I suppose Nolan’s pedigree directing and writing the extremely intelligent Memento and his confident handling of the remake of Insomnia would inspire some confidence. But wouldn’t David S. Goyer’s name on the script raise a few eyebrows of suspicion? Let’s face it – Blade: Trinity was not Bridge of the River Kwai. Of course Goyer brought us good films like Dark City, but I would say that was more a success for director Alex Proyas, whose amazing visuals sold that film to me lock, stock and barrel. Meanwhile, Goyer’s credits are more bad than good. After all, this was the man who penned the Nick Fury: Agent of S.H.I.E.L.D. TV movie starring… wait for it… David Hasselhoff. So Goyer has some sins to answer for. Still, from the sound of things, his Batman Begins script is very strong. All the feedback I’ve been hearing since it opened to $15 million on Wednesday has been positive. MORE than positive, actually. “Enthusiastic” would be more like it. This has been pure torture for me, though. Because I am trying to stay away from spoilers. I accidentally read a preview that gave away the ending shot between Gary Oldman’s Detective Gordon and Christian Bale’s Batman – naturally setting the stage for the sequel. But even with that nugget of information, I’m far more interested in the unfolding of the mythology – just to see if they get it right. The reason I haven’t seen the movie yet is because Cami is pursuing her MBA and started her summer semester this week. She’s taking a condensed course that will rocket her through her workload in something like 7 classes. The bad news is, she’s been out of the house most of this week. An evening class on Monday, Wednesday and Friday from 5PM until 10PM, plus an ALL DAY class from 8AM to 5PM tomorrow, then back to the evening class routine next week and she’ll be done. In the meantime, she’s too exhausted to go out and see movies. Understandably so! So I am left patiently waiting from her to come down from her education O.D. She’s told me to go ahead and see the movie without her. And even though I will probably see Batman Begins multiple times, I don’t roll like that. I’ll wait. For me this isn’t a movie that it would be nice for her to see. I think it’s a movie she SHOULD see. If it’s as good as everyone says it is, maybe it’ll open the door a little wider for her to understand my adolescent admiration of these characters. In light of the revelation that Tom Cruise and Katie Holmes are now engaged, I feel as though my comic from last Wednesday is somewhat prophetic. It certainly doesn’t seem strange that Cruise would propose the week Holmes’ movie opens and the week before War of the Worlds hits theaters, does it? If you’d like a little insight (or conjecture, based on where you stand) about how thoroughly creepy the whole TomKat affair has become, Jeffery Wells’ Hollywood Elsewhere column from this Wednesday is an interesting read. And while we’re taking trips in the Way-back Machine, I thought you guys might get a kick out of revisiting this comic from September 15, 2003. It was a strip commenting on the announcement of Christian Bale being cast as the new Batman. This is one of my personal favorite strips. Look how far we’ve come!